Early in 2000 the PSE (Parallel Single Ended) Woodham 300B was introduced. Constructed as two mono single ended triode amplifiers built into one heavy duty chassis. Each amplifier has its own power supply and output transformer, using CR Development's uniquely designed toroidal transformers. 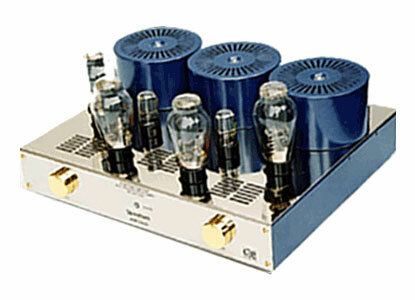 Two legendary 300B output triode tubes are used in each amplifier, driven by a 6SN7 dual triode. The 300B supplied with the amplifier is made by Sovtek in Russia. However, both the Western Electric 300B and KR 300B can be supplied to special order. The power output of the Woodham is about 14 watts of pure triode magic for each channel. However, by paralleling the inputs and putting the outputs in series, (a simple operation), the Woodham offers 24 watts in mono. It is this flexibility that makes the Woodham 300B so unique. In some ways the Woodham represents a break from CR 's traditions. Added features are RCA (single ended) and XLR (balanced) inputs selected by a rear mounted switch. Revised styling for this Woodham product is a departure from the traditional Woodham chassis which is finished is a smart pearlesant paint with ventilated stainless cover panel .